Gerber 400S Presentation Grade Hunting knife mint with original premium grade leather sheath in the box. It has never been used or sharpened. It is 9" overall with finger grooved exotic hardwood handle. If I remember correctly they had 440C stainless steel blades. 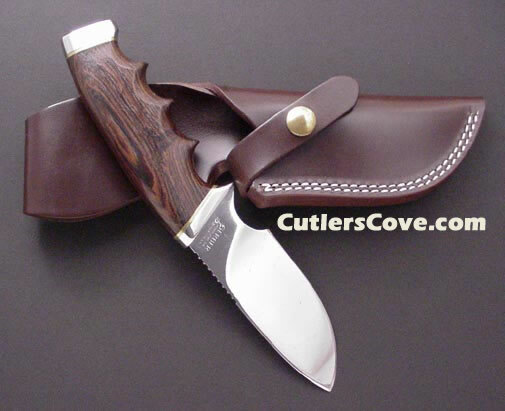 This model was the smallest in the series and is a great wide drop point skinning blade. They were almost custom hand made knives produced in a factory! The Presentation Grade hunting knife series was Gerber's top of the line hunting knives until a few years ago. There were five models starting with the smallest model 400, 425, 450, 475 and going up to the largest 525.